The purpose of the Parent Teacher Student Organization (PTSO) is to enhance and support the educational experience at Voyager Public Charter School, to develop a closer connection between school and home by encouraging parental involvement, and to improve the environment at Voyager Public Charter School through volunteer and financial support. To these ends, this organization is not organized for pecuniary profit or financial gain. 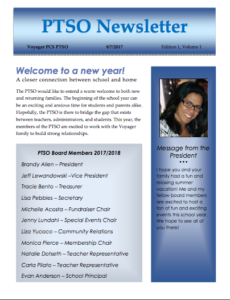 To learn more about your PTSO Board Members, click here. Please consider joining the Voyager ‘Ohana Parent Teacher Student Organization (PTSO). The membership registration form was included in the packet of back to school forms. Your membership helps support a variety of activities and efforts to support the students and teachers at Voyager. If you turn this in with the rest of your forms, please turn in this form separately and write a separate check payable to Voyager ‘Ohana PTSO. 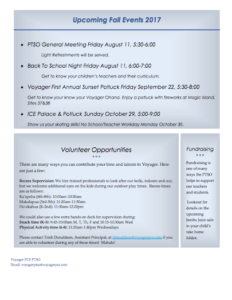 If you have any questions about the PTSO or how you can get involved, please contact us at voyagerptso@voyagerpcs.com. Mahalo! Voyager Ohana PTSO earns up to 15% of qualifying purchases when you purchase through Amazon Associates.